Ball in the Bucket to Win! 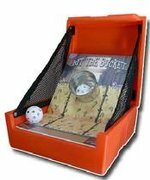 Description: Toss the ball and try to land it in the bucket. It's harder than it looks.